Why is the Chinese Communist Party Discussing Its Legitimacy? Shortly after being officially appointed leader of China, Xi Jinping started a campaign to rid the Chinese Communist Party of malfeasance. Officially, the aim was to end rampant corruption and bolster the Party’s ruling credentials; unofficially, Xi is seeking to dislodge a powerful political network controlled by his predecessor Jiang Zemin. Either way, the anti-corruption campaign, which has seen thousands of high- and low-ranking officials purged, has hung like a Damocles Sword over the Party’s mandate as rightful rulers of China. Recently, however, the Party has decided to publicly discuss and allow uncensored citizen discussion of the question of its legitimacy. On Sept. 9, Wang Qishan, the head of the Party’s anti-corruption agency and de facto right-hand man to Xi Jinping, told over 60 former politicians and academics at a public meeting in Beijing that the “legitimacy of the ruling Party lies in history, its popular base and the mandate of the people,” according to the state-run Xinhua News Agency. The Chinese social media was soon filled with talk about the Party’s claims to political legitimacy. The Chinese communist regime has openly addressed its right to sit on the throne before, and by no coincidence, after tumultuous events that shake its political legitimacy. For instance, after the Tiananmen Square massacre on June 4, then Party paramount leader Deng Xiaoping weaved through the message in his speech to military officers from the People’s Liberation Army that they could no longer rely on killing for legitimacy but rather on continued economic reform to win the support of the Chinese masses. Analysts said that Xi Jinping’s China today faces pressing issues that once again calls the Party’s legitimacy into question. 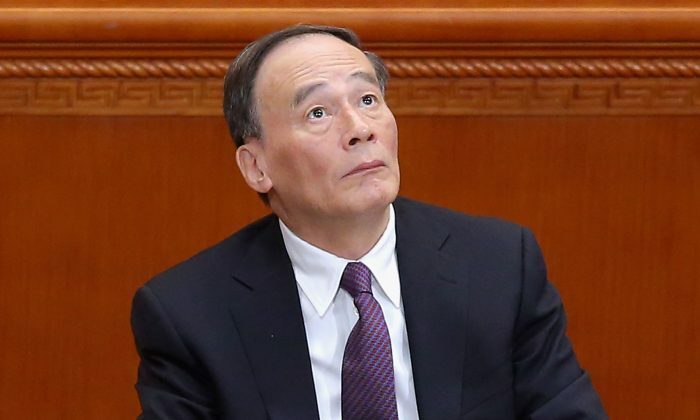 First, it seemed appropriate that Wang Qishan brought up the issue of legitimacy because the blustering anti-corruption campaign he helms has ruffled the feathers of Party elders, analysts said. Revealing the extent of corruption also has left Chinese citizens wondering how Party officials came by such huge wealth in the first place, hence throwing the Party’s mandate into question. Next, the series of disasters—a stock market plunge in July, a chemical warehouse explosion near residential areas in the coastal city of Tianjin in August—has left the Chinese people troubled and Chinese society in a fragile state. Finally, Xi Jinping is due to visit President Barack Obama in the United States at the end of September, and he is likely to face questions about the regime’s mass crackdown on human rights lawyers, tearing down of church crosses in eastern China, and hacking and espionage of US companies. Xia Ming, a professor at the City University of New York and expert in Chinese elite politics, believes that the Party “is now facing a legitimacy crisis,” and its statements on legitimacy are empty rhetoric. In the West, Xia explains, legitimacy is built upon procedure and open elections with periodical renewal of mandate. A legitimate government allows it to survive in the event of a crisis, such as foreign invasion or political and economic challenges. “The argument of Wang Qishan and the Chinese media is this: we have two sources of legitimacy, therefore our system is legitimate,” Xia told an Epoch Times reporter over the telephone, referring to Wang’s remarks about about history and support of the people. But the performance argument is being undermined by an economic slowdown that the Party, due to deep structural factors, seems unable to arrest. Li Tianxiao, a veteran political commentator for New York-based New Tang Dynasty Television, attempted a more optimistic appraisal: “Wang Qishan’s remarks are in fact an attempt to shape public opinion about the changes to China in the future,” a subtle hint that perhaps the Party won’t always be the only game in town. Frank Fang and Matthew Robertson contributed to this report. Wang Qishan is looking to get an extradition agreement with the United States, but it is an unlikely arrangement. Ostensibly, the parade was meant to celebrate the 70th anniversary of China's defeat of Japan in the second world war.